We’ve been feeding whole grains to our chickens for 2-3 years now. 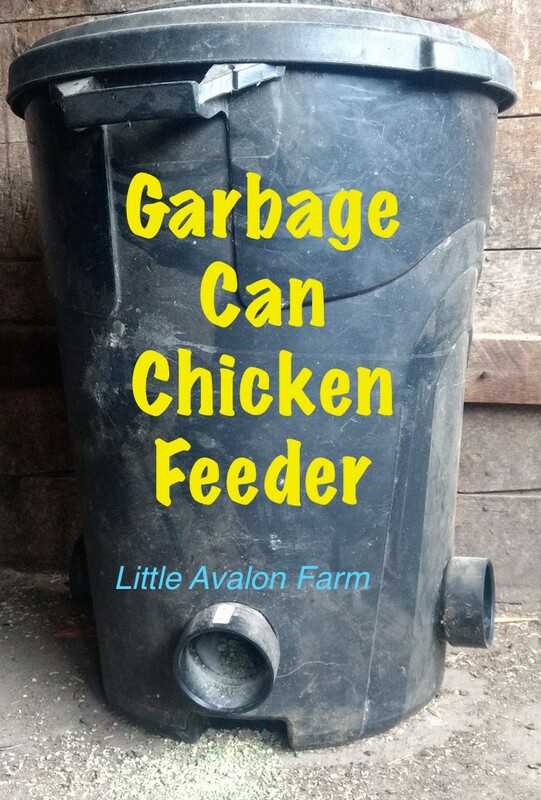 About a year and a half ago, we finally landed on the low maintenance, no waste chicken feeders we use today: garbage can chicken feeders. This method allows us to feed one or two times per year and results in zero waste and grain throwing. To get started, choose a container. We had garbage cans on hand so used those. We have made feeders in 5-gallon buckets and I’ve seen storage totes used as well; there are no set rules for the container type as long as it will hold up to the weight of the feed with holes drilled in it. Because we fill ours up and then move them to the coop, we prefer garbage cans for ease of moving. Next, choose the size of PVC elbow you want to use. We’ve used 2″, 3″ and 4″ elbows. The 2″ works reasonably well in a 5-gallon bucket but the chickens took quite a bit of training to get them used to such a small hole. Next, we used 4″ which works great for chickens and ducks alike, but has one major drawback: goat kids can reach the feed as well. Since we don’t want to worry about whether or not the goats go in the chicken coop, we decided to try out 3″ and they work, too. If I didn’t need to worry about goats, I’d prefer the 4″ but that is primarily because the model of 3″ elbows we found has a more rounded curve versus the nearer 90 degree curve of a 4″ elbow and some grain can spill out. The chickens didn’t seem to have a preference. How Many Elbows Should I Use? Install the elbows by lining them up from the inside to make sure there is a gap of 1-2″ from the bottom to allow feed to fall in under the elbow. Trace the outside of the hole on the side of the can and cut out the hole with a box cutter. The hole should be as snug as possible to help keep the elbow in place. Simply install the elbow, aim it down to the bottom of the can and move onto the next. If you are planning to leave your garbage can feeder outside, add silicone to seal the hole to keep it water proof. Once all the elbows are installed, add feed, put the lid on and you’re ready to use it. They’re incredibly simple to make. When I put a new can in, I sprinkle some of the feed onto the flat surface of the elbow so the chickens can see/smell the feed inside. They figure it out pretty quickly. You can use any normal chicken feed in these feeders, but I have found that, when feeding mixed whole grains, they will throw the grains out to get to their favorite. To solve that, we stopped mixing and instead feed a single grain per feeder. There are many benefits to this method, particularly that chickens can choose what they need at any given time, so they can up their protein intake during molt, for example, by eating more peas. This helps keep egg production more consistent throughout the seasons. We feed whole oats, barley and field peas, so each of those gets a garbage can. It is such a nice feeling to fill the feeders and walk away. I check periodically to track their eating progress, but there is no hauling heavy grain in ice and snow and no worry about leaving for a few days – the chickens will be fed! 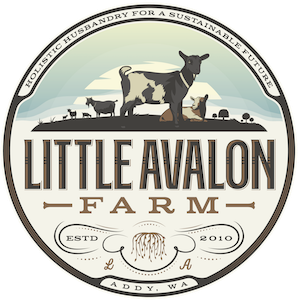 Low maintenance feeding solutions are absolutely essential to maintaining order on a busy homestead with kids, homeschool, working parents and “normal” life all vying for attention. I get asked a lot, “How do you do it all?” The answer is with systems like this.